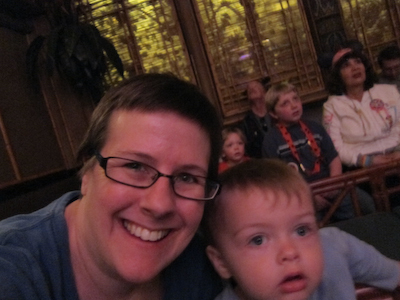 Today was Theo’s first visit to the Tiki Room, officially known as the Enchanted Tiki Room–as opposed to, I suppose, the Tiki Room where the birds don’t sing words and the flowers don’t croon. Sounds like a sucky attraction to me. 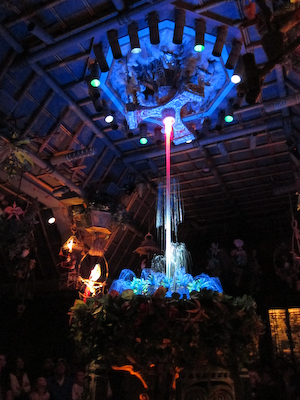 Good thing we have the Enchanted Tiki Room. 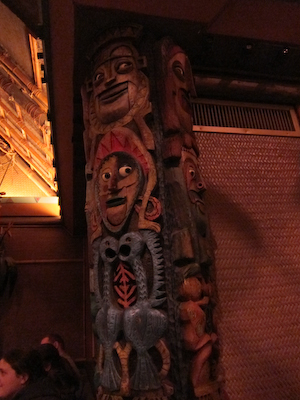 The Tiki Room is sponsored by Dole. The upside of this is that there’s this Dole booth and you can get pinapple spears (my favorite–long chunks of pineapple) and the infamous Pinapple Whip. I’m about to be blasphemous when I say that I’m just not bowled over by the Pineapple Whip. It’s like ice cream but it’s not ice cream–actually it’s a bit more like frozen yogurt. But you can get said Whip outside of the Tiki Room. There is always a long line for the Dole products. 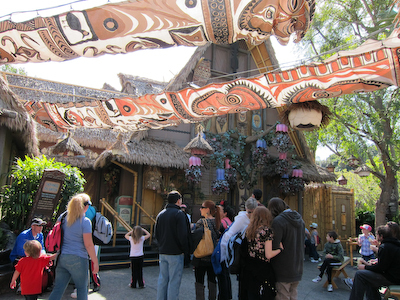 Many people confuse the line for the Pineapple Whip as the line for the Tiki Room. 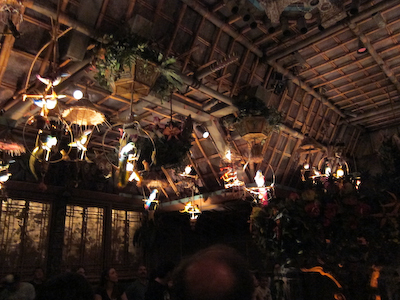 Make no mistake–the Tiki Room does not have a line. 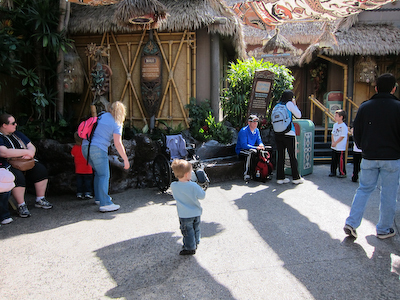 If you are wanting to go inside the Tiki Room and you find yourself standing in line, you’re in the wrong place. The line is for Dole items. 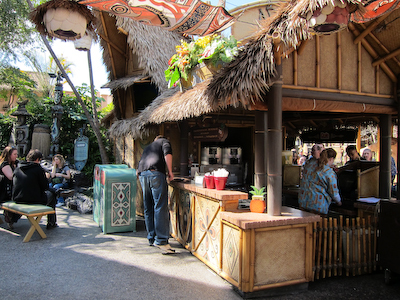 If you’re in the mood for Pineapple whip and have 15 minutes or so to kill, and don’t want to wait in the regular line, you can get inside the Tiki room waiting area and there’s the other side of the Dole booth there where you can order what you want without waiting. I will admit that due to some stress reasons (read: toddler meltdown) I did not actually get a picture of the outside of the Tiki Room. Oops. I’ll slip one in later, okay? Upon entry, you actually sit in a courtyard waiting for your turn to go into the theater. Theo (blue shirt, middle) is pretty much convinced that his mother has left him. What kind of mother does that??? 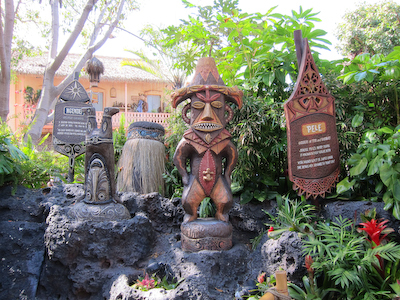 The cute thing about the Tiki Room waiting area is that there are statues around that animate themselves periodically. They are supposed to represent gods or goddesses of one thing or another, though it’s not always clear what they’re talking about. Pele, the goddess of fire and volcanoes. Also soccer. Finally, the doors to the theater open. Apparently Walt envisioned this being a dinner theater show. He must have been on crack or something because seriously, you couldn’t fit more than 10-12 tables in this room. When the doors open, step inside. We got seated and Theo became immediately upset. He’s not a fan of the dark, and while the room itself wasn’t terribly dark, compared to the sun outside it was. Also, I dressed him in a long-sleeved shirt and it turned out to be kind of hot, so he wasn’t particularly thrilled with that either. First of all, there’s a bit centerpiece of flowers and stuff. Then the birds wake up. There are four main birds, one for each branch of the audience, which is sort of a cross shape. Also, there’s no flash photography, so these pictures are going to be totally awesome. The birds light up and speak. Photography is limited. Once the individual birds do their comedy spiel, other birds jump in and they all sing their signature song. 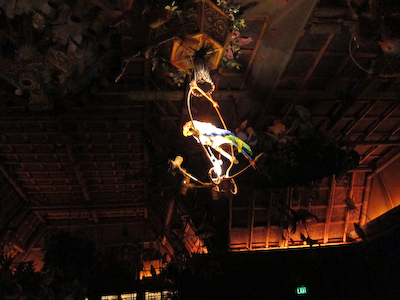 I think the Tiki Room song is probably the 3rd most recognizable song at Disneyland. Numbers 1 and 2 being Small World and It’s A Pirate’s Life For Me, respectively. The centerpiece in the middle (imagine that–a centerpiece in the middle!) turns into a fountain and lights up and white birds descend from the heavens above to sing a song. Can't you just hear the choir of angels? 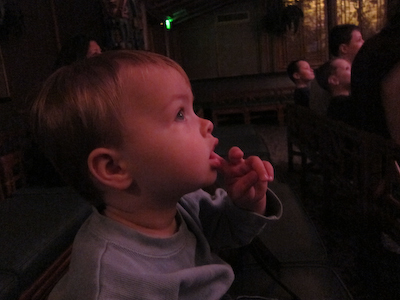 Theo was particularly fascinated by this part. "Let's all sing like the birdies sing--tweet, tweet tweet, tweet tweet"
The audience is invited to sing along. Some of us are more enthusiastic than others. At one point, it starts to “rain” outside and there’s thunder and lightning, and for some reason this naturally leads into the columns in the room bursting out into song. Their eyes move too. It's a little bit creepy. Also, at some point, the flowers sing. Or should I say croon? These are kind of like a hyped-up wedding centerpiece on crack. If wedding centerpieces were animatronic or something. These flowers actually remind me of Little Shop of Horrors (bop she-bop), so I always feel a bit uneasy wondering if they are going to eat me. 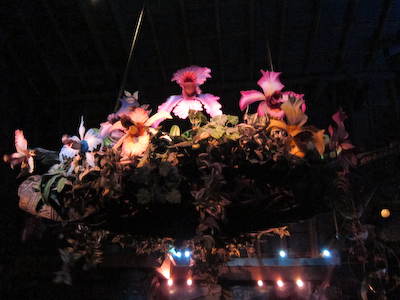 The Tiki Room show takes aobut 10-13 minutes and is quite cute. 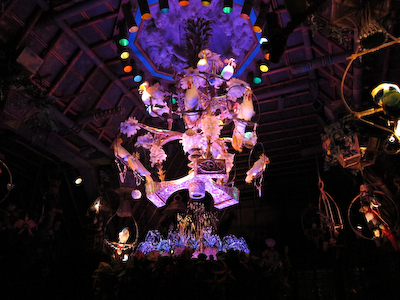 It’s air-conditioned, so if you’re looking for a place to rest your feet and also hear singing flowers at the same time, the Tiki Room is the perfect attraction for you. I had Dole Whip a few times when I lived in Hawaii. It’s like pineapple frozen yogurt served with a spear of pineapple. Every time I had one, I swore I’d never eat pineapple again. The Whip is so much pineapple, it gave me pineapple overload. I love the Tiki Room in Disney World, Shelby! Thanks for sharing — brought back some good memories. I remember especially loving the part where it rains and thunders. 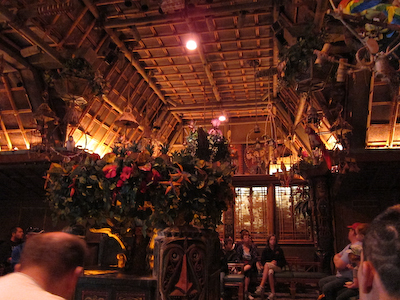 I miss the classic Tiki room experience and am always happy to get a chance to see it at Disneyland. WDW has completely ruined the attraction. 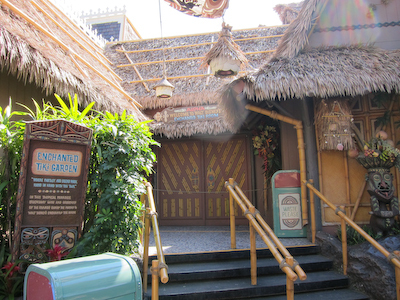 Tiki room is one of those attractions I worry is going to close down to make way for the wall e trash dump or Rapunzel hair salon or something. Pineapple whips are a much revered treat in my family and traditionally whoever is at MK eating one calls up the others and brags about it.